The new Olympus FluoView FVMPE-RS, a dedicated multiphoton microscope system, enables high-precision, ultra-fast scanning and stimulation, allowing researchers to see deep within specimens, take measurements at the highest speeds, and capture images, even when working under the most demanding conditions. With its high speed and precision performance, the system is designed for electrophysiology and optogenetics studies. It is also a good match for applications such as high-speed calcium and in vivo imaging, peristalsis and blood flow studies, mosaic imaging, connectomics and functional brain imaging, stem cell research, and any field that requires precise colocalisation, uncaging, simultaneous imaging/stimulation, extensive real-time signal processing, or multipoint mapping. Its design offers ready adaptability for researchers who design their own custom-built systems as well. The precision timing on the system allows for microsecond repeatability and control of multiple imaging and stimulation protocols, as well as millisecond repeatability over days of time-lapse imaging. Complex multi-position imaging or optogenetic stimulation protocols can be accomplished using the advanced stage control and sequence manager. The system captures 438 frames per second (fps) at 512x32, the fastest rate commercially available. It also captures full-frame, 512x512 images at 30 fps without any reduction of the field of view, a critical feature for many functional imaging studies. Its scanner unit combines a newly designed resonance scanner with a galvanometer scanner to provide both speed and excellent definition. The resonance scanner offers an exclusive non-linear sampling method for smooth imaging without jitter. 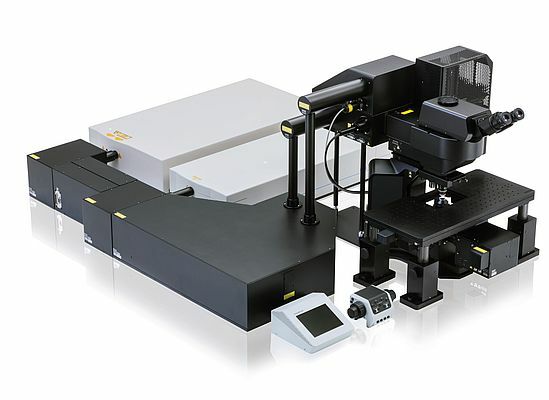 An optional third galvanometer scanner is also available for imaging with simultaneous 3D stimulation or uncaging. The system's multipoint mapping capability allows ultra-high-speed measurement of rapid fluctuations in groups of cells for functional imaging studies, 3D intensity measurement or mapping with high signal-to-noise performance.